Jews Museum and Grand Bazaar. 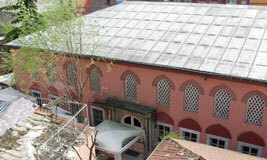 Ahrida Synagogue - One of the two remaining synagogues in Balat. It is the oldest and probably most beautiful synagogue in Istanbul. It was founded before the Muslim conquest of Istanbul in 1453 and has been in constant use ever since. 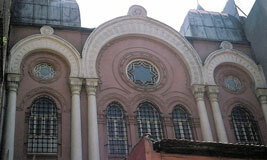 Neva Shalom Synagogue - Located in Karakoy, this is the central and largest Sephardic synagogue in Istanbul. It was inaugurated on Sunday March 25, 1951 and is open to service and is also used for major functions of the community such as bar mitvahs, weddings and funerals. The bema and ark are at the front of the hall, with seating around three sides. accounts for 4 percent of the total Jewish population of Turkey. Visits to the synagogue can be made during weekday mornings and for Shabbat services on Saturday mornings. 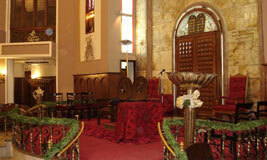 The synagogue holds weddings, Bar Mitzvahs and other religious ceremonies in the Ashkenazi tradition. Rabbi Dr. David Marcus, who also established the Jewish school Bene Berit, served as Rabbi and spiritual leader until his death in 1938. Rabbi Mendy Chitrik has served as the rabbi of the Ashkenazi Synagogue since 2003. Schneider Temple - which means Tailors Synagogue, was founded in 1894 by the Association of Ashkenazi Tailors (a group of Jewish tailors residing in Galata). In 1998, it was converted into an art gallery, which today is associated with a research center specializing in fashion history. Dedicated to preserving the history and culture of Jewish people through the lens of the fashion industry, Schneider Temple holds workshops and publishes its research to foster cultural and religious understanding on an international level. 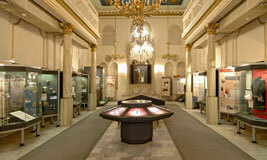 Turkish Jews Museum - Located in Karakoy, is a cultural center inaugurated on November 25, 2001. The Zulfaris Synagogue was restored and remodelled to serve as the museum building. It contains a huge collection of old photographs, documents and religious objects relating to Istanbul's Jewish population. The museum is open daily, except on Saturday and religious holidays.